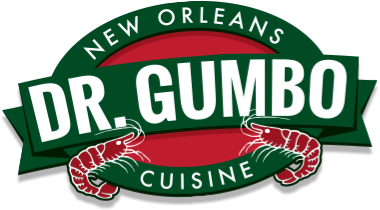 Heat Dr. Gumbo’s shrimp & corn soup, cheese, & green chilies together and serve hot with chips. Place all ingredients in a sauce pan, heat on low and stir. Serve warm with tortilla chips, crackers, corn chips, or toast points. Mix Crawfish Julie with bread crumbs & shredded Romano cheese to thicken (eyeball to your preferred consistency). Wrap bread in aluminum foil and bake in the oven at 350° for 15 minutes to warm. Mix equal parts Dr. Gumbo’s red beans with cooked rice, add some breadcrumbs & an egg to thicken up “batter.” Roll into small balls. In a separate bowl, beat eggs & mix in milk to make a wash.
Dip red bean & rice balls in the egg wash & coat with remaining breadcrumbs. Fry in oil at 360 ̊ until golden brown. Serve with Remoulade, tartar sauce, Green Goddess dressing, or Ranch dressing. Sautee onions & bell peppers in olive oil. Add mushrooms, cook until tender. Add beans & salsa, simmer until well blended (about 3 minutes). Stir in cilantro. Roll up into a flour tortilla & sprinkle with goat cheese. Bake in oven for 15 minutes @ 350°. Mix olive oil & fresh lime juice in medium bowl. Add coleslaw, green onions, & cilantro. Toss together to coat. Season slaw with salt & pepper. Spoon Dr. Gumbo’s black beans on tortilla. Top with feta & slaw and serve.